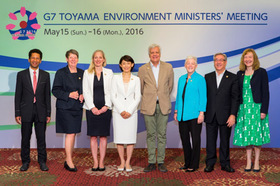 Minister Marukawa attended the 1st advisors' council to promote the newly launched 'Visit! 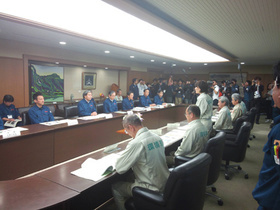 National Park' Project. 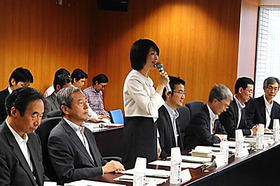 Eight experts and Tamura Director-General of the Japan Tourism Agency has exchanged wide range of opinions. 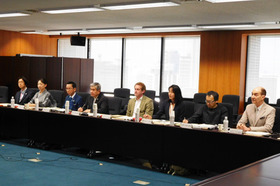 The advisors including Mr. Wakui, chairperson of the council (center). 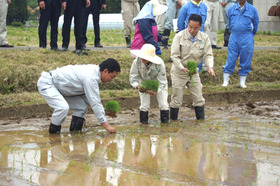 Minister Marukawa and State Minister Inoue visited Naraha town in Fukushima and planted rice seedlings into a decontaminated paddy field. 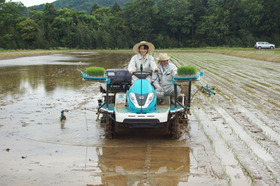 Rice Planting is resumed for the first time in six years, with Mayor Matsumoto and local residents. 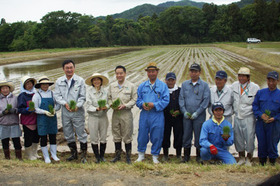 Minister Marukawa(Center) and State Minister Inoue(Right) planted rice seedings with Mayor Matshumoto(Left). 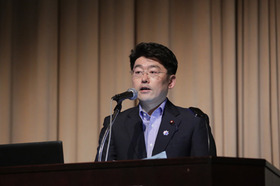 Mr. Oniki, Parliamentary Vice-Minister of the Environment attended the public symposium on the International Day for Biological Diversity. 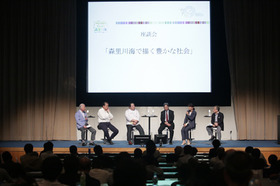 Intellectuals discussed the theme, 'Mainstreaming Biodiversity: Sustaining People and their Livelihoods with Mori (forests), Sato (the countryside), Kawa (rivers), and Umi (the sea)'. 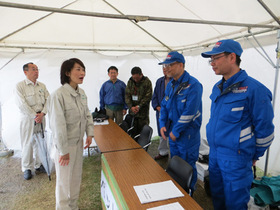 Visited the exhibition on Mori, Sato, Kawa, Umi Japan Relay Forum 2015/2016. 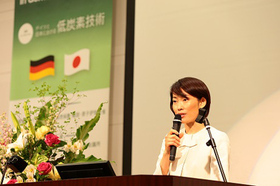 The Minister of the Environment, Tamayo Marukawa and the Federal Minister for the Environment, Nature Conservation, Building and Nuclear Safety of the Federal Republic of Germany, Barbara Hendricks made the opening remarks at the international symposium on low carbon technologies. 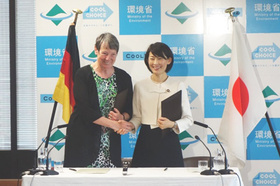 They held a policy dialogue on Climate Change, Resource Efficiency and 3Rs, Marine Litter and signed the joint statement on decarbonaized societies. 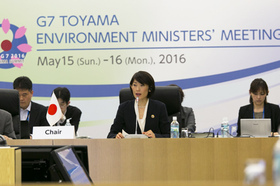 Minister Ms. Marukawa hosted the meeting and seven themes were discussed in the meeting, namely Climate Change and Related Measures, the Resource Efficiency, the 3Rs etc. and end with a joint communique. 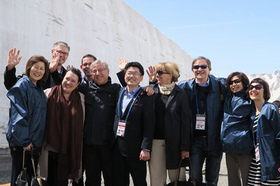 They also visited Itai-itai Diseasemuseum and so on. 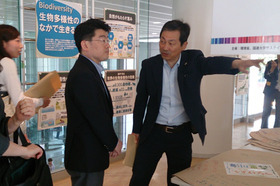 Mr. Oniki, Parliamentary Vice-Minister of the environment visited Tateyama. 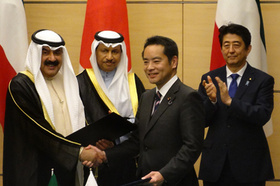 State Minister Shinji Inoue and Mr. Khaled S. Al-Jarallah, Deputy of the Minister of Foreign Affairs signed the Memorandum of Cooperation in the field of municipal waste in Prime Minister's Office of Japan. 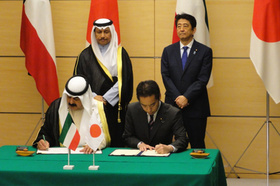 It is expected to further strenghthen the cooperation between Japan and Kuwait in the field of waste. 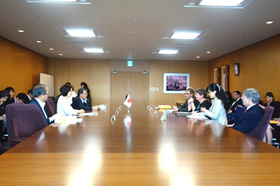 Minister Tamayo Marukawa exchanged views on the prompt and appropriate disaster waste management and a field survey for developing next strategies of the disaster measures for pets with Mr. Kabashima, a prefectural governor of Kumamoto, Mr. Onishi, a lord mayor of Kumamoto city and Mr. Nishimura, a mayor of Mashiki town.